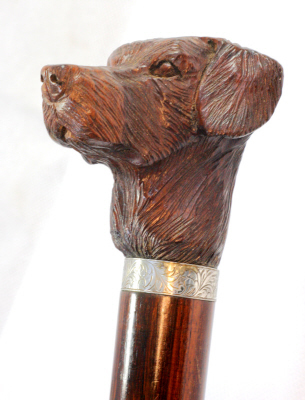 Superb carving of a Labrador in rosewood. The study mounted on a polished rosewood shaft with base metal ferrule. The silver holding the Assay marks for London 1979 with the makers punch JLK The carvers signature is found etched into the upper area of the rosewood shaft. The signature being M.ELLIOT. Condition Beautiful condition throughout free from breaks or cracks.